As a channel reseller, you’re always looking for ways to identify new market opportunities with new technologies and create the perfect offerings for your clients. What does an ideal client for Samsung DeX look like? The quick answer is a client whose employees are on the go, consistently multi-tasking and whose business demands operational agility. Having a Galaxy Note8 on the go and Samsung DeX docking station at the office allows ultra-mobile employees to have an uninterrupted workflow when they come into the office. Unlocked Galaxy devices, in particular, also give these clients the freedom to choose the best carrier for their business needs, eliminate bloatware on company devices, customize their devices for specific roles in the company and ensure that they are always up to date with the latest software. Today, many industries have the need for employees to travel frequently or work from virtually anywhere. Architects, field service workers, engineers and sales professionals all handle sensitive information and often have the need to go mobile for meetings or off-site inspections. The Galaxy Note8 has features to simplify multitasking and is the perfect tool for these types of employees. DeX enhances the convenience of the Galaxy Note8 by providing a simple way to launch a full desktop experience from a phone. Think of an insurance adjuster in the field, gathering data and taking photographs of a client’s damaged vehicle. They’re filling out claim forms on their Galaxy Note8, capturing high-quality photos with dual camera technology and taking notes with the S Pen and On Screen Memo capabilities. Access professional development tools designed to give you a competitive edge. Once the insurance adjuster gets the necessary information, they head back to the office and place the Galaxy Note8 in its DeX docking station. DeX, when connected to a monitor and paired with a mouse and keyboard, instantly turns their mobile phone into a desktop-like experience. Doing so allows them to quickly access all of the data and documents from the scene and file the claim in a timely manner. DeX provides a full-screen experience with multiple windows and can run any Android application including productivity suites like Microsoft Office. Resellers should also consider organizations that favor hot-desking due to a largely remote or traveling workforce. Organizations that equip their employees with a Samsung Galaxy S8 or Note8 and a DeX docking station provide all the advantages of Microsoft Office on a mobile device — word processing, spreadsheet, presentation and file management capabilities — along with the ability to transfer those applications into a desktop view wherever a monitor, keyboard and network are available. With DeX, on the go employees can easily adapt to hot-desking environments, where they need the ability to set up and then pack up quickly throughout the day. Similarly, organizations that employ frequent travelers can equip them with a portable keyboard to get work done in transit. At the hotel, DeX can easily connect to the HDMI port available on most hotel TVs. This makes the technology ideal for professionals with travel-heavy schedules. Organizations that employ a VDI solution to deliver a desktop interface can also easily take advantage of DeX. 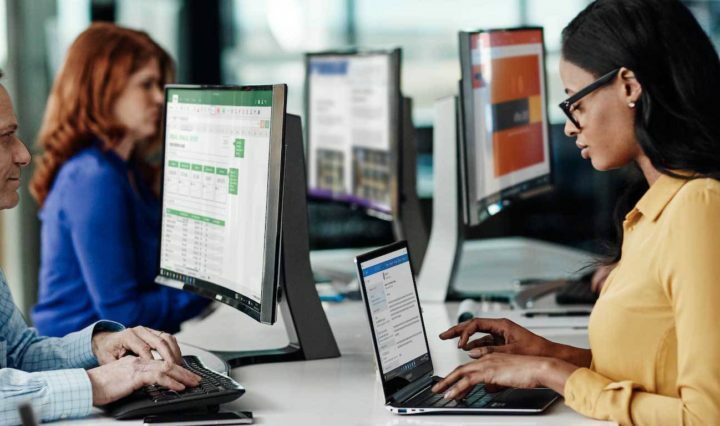 VMware, Workforce ONE and Citrix Receiver solutions give DeX users access to their virtual Windows desktop as well as their Android apps. The ability to access a VDI session as well as native Android apps on one monitor gives employees full mobile workflow flexibility. Enterprise security is top of mind for customers who employ VDI, and DeX does not disrupt that secure architecture. With Knox — a defense-grade mobile security platform built into Samsung devices, including the Galaxy Note8 — enterprise data remains secure and controlled by the enterprise, while personal information remains separate but still available to the user. For the enterprise, unlocked phones automatically come with less bloatware, leaving more space for companies to install corporate-sponsored applications. IT professionals can easily and securely configure devices with Knox Configure and turn them into purpose-built devices to support specific needs. Unlocked devices also give organizations the freedom to optimize cellular and Wi-Fi connectivity by accessing the best network and plan at the moment. These devices are supported by most major networks, letting international business travelers take easy advantage of lower local rates without a complicated plan. Overall, the combination of Samsung DeX and unlocked phones can bring your clients a new level of customization and control when it comes to managing their devices and the ability to provide more convenience to their employees on the go. Learn more about the expanding universe of Samsung DeX available to your customers from Samsung. Register on the Samsung Partner Marketing Hub for free marketing content and tools.